The play "Shin Usuyuki Monogatari" was originally written for the puppet theater (Bunraku) and staged for the first time in the 5th lunar month of 1741 in Ôsaka at the Takemotoza. It was adapted for Kabuki a few months later and staged for the first time in the 8th lunar month of 1741 in Kyôto at Hayagumo Chôdayû's theater, produced by Sakakiyama Jûtarô I [casting]. "Shin Usuyuki Monogatari" was originally a 3-part drama. The current version is now made up of 4 acts (divided into 7 scenes). "Saisaki-tei Sengi" ("the Inquiry at the Saisaki Residence"), commonly called "Sengi" ("the Inquiry"), is the second act of "Shin Usuyuki Monogatari". At that night, Saemon comes to the mansion of Saisaki Iga-no-Kami in order to meet to Usuyuki-hime secretly. When the young lovers meet each other, Matsugae who is mother of Princess Usuyuki finds them. Matsugae says Saemon to go home tonight. She says that if they love each other, she would make them marry in the near future. Saemon accepts it, and is going home. Then the coming of an envoy of the Shogunate office is announced. Katsuragi Minbu, Akizuki Daizen, Sonobe Hyôe, and Saisaki Iga-no-Kami appear on the scene. Minbu brings the sword box there. Hyôe and Iga-no-Kami are surprised to see Saemon there. Every concerned person is gathered there. Minbu says that a mark that constituted a curse was found on the sword. And he says that Saemon is the most suspicious person of it. Everyone, especially Saemon is surprised very much. Saemon opens the sword box, and searches of it. There has been a curse mark on it really. Saemon has no idea why a curse mark there is. Saemon asks Minbu to hear Kuniyuki's testimony, because Kuniyuki went to the temple with him. However, everyone knows that Kuniyuki is missing now. Akizuki Daizen says that Kuniyuki's testimony isn't necessary, because he has a secret letter. He shows a letter that was written by Princess Usuyuki to Saemon. Daizen says that the letter is evidence that Saemon and Princess Usuyuki have plotted against the Shogunate government. And that was proved, because Saemon is there. Saemon is cornered, and he tried to commit suicide, seppuku. Minbu stops it, and says Saemon to defend himself again after Kuniyuki appears. Then the dead body of Kuniyuki is carried there. Saemon is disappointed completely. Minbu does an inspection of the dead body himself, and find a scar of the dead body's throat. That scar seems to be made with a dagger that was thrown by an expert. Minbu remembered who could make that scar, but he says nothing then. Iga-no-Kami and Hyôe ask to make them investigate their children. 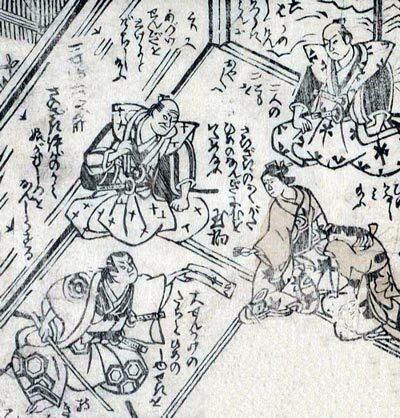 Iga-no-Kami will investigate Saemon, and Hyôe will investigate Princess Usuyuki. Minbu accepts it, and Hyôe takes Princess Usuyuki to his mansion.